See individual tracks for details. 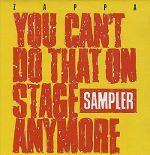 Sampler album for the You Can't Do That On Stage Anymore series (6 volumes). ZAPPA 7 1988-06? 5016583600716 UK edition. 101581 1988 3229261015814 French edition. D4 74213 1988? 0013347421346 US edition, XDR. T ZAPPA 7 ? 5016583600747 UK edition. This page was last modified on 7 May 2014, at 13:57. This page has been accessed 14,967 times.